- It is safer than most other modes of heating as no flammable materials such as propane are used. - It is relatively easy to install though the services of an electrician are recommended. ​- It requires very little maintenance. - It is also energy efficient because it uses electricity instead of oil which can be costly. - It can be used in both residential and commercial buildings for heating not just garages and workshops but also stores, warehouses, and workshops. It is important to emphasize that before installing and using an electric heater, you should carefully read all the safety and operation instructions described in the user manual, and to request the services of an electrician for the actual installation. This article will compare Dimplex DGWH4031 garage heater with Fahrenheat FUH54 and NewAir G73. These were not just the most popular among Amazon customers at the time this article was written, but they had also received excellent reviews from most Amazon buyers (an average of at least 4 stars each out of 5 stars!). These heaters will require that you install a 240V line in your garage or wherever you are planning to install the heater. Unless you're an expert in electric circuitry and wiring, you should definitely get an electrician to do the job. Once the new 240V line is available, the Fahrenheat and NewAir heaters will need to be hardwired. ​Dimplex gives you also the option to plug the heater to a 240V outlet using the 6ft cord that is included as long as such a 240V outlet is available; otherwise it will also need to be hardwired to the 240V line. ​Single pole thermostats break only one side of the power line to the heater which cannot be completely turned off. Therefore, some power is continuous to the heater at all time. The control knob will have a low temperature setting, but not an “off” setting. When the low temperature setting is selected, the thermostat will start running to raise the temperature as soon as the temperature falls below the low setting. Double pole thermostats break both sides of the power line and the control knob will usually have an explicit "off" setting. When the off position is selected, all power to the heater is interrupted. To reactivate the thermostat, you will need to select one of the temperature settings on the knob. Adjustable louvers allow easy control of the airflow to direct heat to desired area. You can simply lift up on the louvers if you need heat projected straight ahead of the unit or press down on the adjustable slats if you need to project heat towards the floor. This adjustable louver functionality, coupled with the maneuverability of the attached mounting brackets allow projecting the heat to almost anywhere that needs additional warmth. Note that, even though, Dimplex DGWH4031 has no louvers, it comes with a versatile wall or ceiling mounting bracket that swivels and tilts to direct heat where it is required. All three heaters provide the brackets needed for wall or ceiling mounting. Fahrenheat and NewAir require to hardwire the heaters. Dimplex gives you the option of hardwiring or using a 240V outlet to which you can connect the heater with the provided 6 ft. cord and the special 3-prong 240V plug. ​In theory, you could plug all three heaters to a 240V outlet, if such an outlet is available. But note that using a plug might void its UL (Underwriters Laboratories) approval and void the warranty. So you should check the user manual, if you don't want to hardwire the heater and prefer using a cord with a plug. UL stands for Underwriters Laboratories Inc. which is an independent non-profit organization, in operation for more than a century, that writes and tests products for safety and certifies them. UL has developed more than 800 standards for safety, and millions of products and their components are tested to ULs safety standards. For exact price information on these three heaters, please refer to the Amazon section at the end of this article. So which of the three garage heaters to buy? 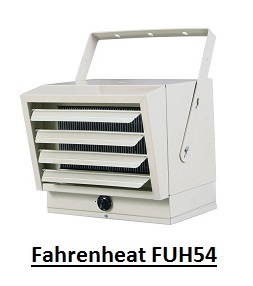 Fahrenheat FUH54 and NewAir G73 heaters are more powerful and will heat a larger area than the Dimplex DGWH4031. 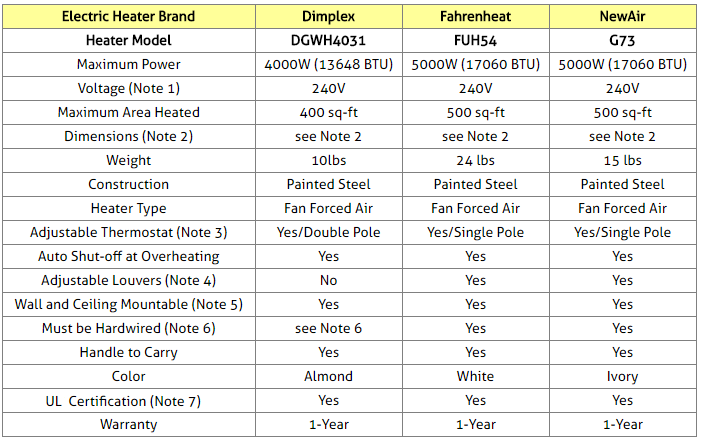 Fahrenheat FUH54 and NewAir G73 heaters are equipped with a single pole thermostat, while Dimplex DGWH4031 is equipped with a double pole thermostat (please see Note 3 above for an explanation of single vs. double pole thermostats). Fahrenheat FUH54 and NewAir G73 heaters are required to be hardwired, while Dimplex DGWH4031 gives you also the option to plug the unit with the provided cord. 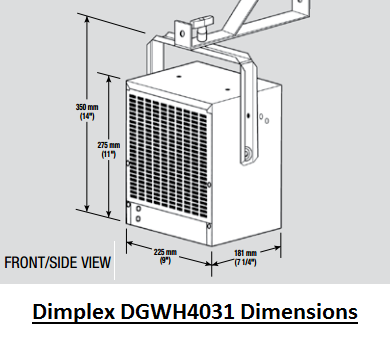 Dimplex DGWH4031 does not have louvers, but it comes with a versatile wall/ceiling mounting bracket that swivels and tilts to direct heat where it is required. Please click the garage heater of your choice below for price information or to purchase.